Okay, well first of all, I found out how much my dress cost and I am horrified. Plus I still need to get it altered a bit. I think I'm going to really need to consider selling the dress after this. Although it would also work for a red carpet event. So maybe I just need to work on getting invited to one of those. However, my mother is absolutely over the moon and so happy that I picked a "real" dress that it's basically worth it. There's a lot else that she's not thrilled with and this gives us a compromise. And she paid for it. Now, rings! Well, I meant to post a photo of my engagement ring but apparently I never got around to it, so here you go! That's the Etsy special. 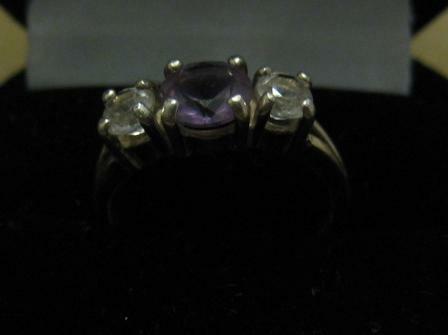 I'm not sure why it looks so dark, but at least you can see the purple clearly. Now, my wedding band is what everyone's been asking me about...and it's not the great story you're all hoping for probably. 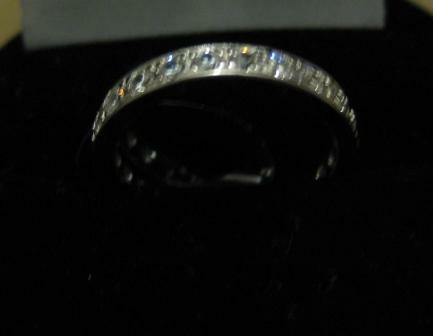 Basically, I wanted an eternity band with stones going all the way around, but I didn't want diamonds. While at the mall over the weekend, I wandered into The Limited, and they had an eternity band with cubic zirconia. It was $26.00 and they have a student discount, so I bought it! The first picture shows the stones in detail, the second blurry one shows how it's still got a colorful sparkle despite being CZ. I probably won't wear both rings together as they don't match up perfectly well. I'll probably wear the band on my left ring finger and the amethyst ring on my right, or not at all. I don't feel like either of them will be the rings I wear forever and ever--when we're old and rich I'll probably want to upgrade to some heirloom diamonds or something like that. But for now, they represent me very well, and you can't beat the price--$83 for both! I love your engagement ring - it's gorgeous! I've always wanted a coloured stone rather than a diamond myself. love the rings, and the dress too. I also got a real dress (the other kind just didn't feel fancy enough) that was not poufy. Beautiful choices! You can NEVER go wrong pleasing mom in a decision like this. I got a used version of the dress mom fell in love with (lucky!) but it was so worth it. This isn't just about you -- and if you can do it, good for you. As for the rings, I couldn't agree more. 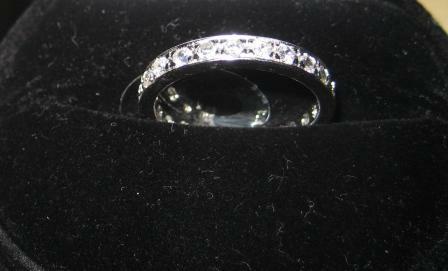 I use a generic band or a CZ eternity band too. You can never win the diamond competition, so there's really no point in trying. I love colored stones, but I find they engage too much discussion. Can't go wrong with simple. Recently found your blog and love reading about the wedding as I'm getting married this October! Your rings are beautiful! Who would guess that you got them for such a great deal!? Your rings and dress are beautiful! And what a steal for the rings! Ok, now I'm serious considering checking out The Limited too. The ring is beautiful and the fact that you got it for a steal makes it that much more beautiful. Love the dress and your engagement ring too! I've heard about wedding dresses costing thousands of dollars - so your price seems very reasonable. My dress was $500 and I got it 11 years ago. I got it at Bridesmart! From what I've seen, I think your dress was reasonably priced. And from the wedding-dress shopping I've done with friends, my fave dresses were always the Maggie S. ones. :) Well done! @Dog, you're right--the colored stone has engendered a lot of commentary. Most people don't even realize I'm engaged unless I mention it--I guess wearing a ring on that finger no longer really signifies anything, unless it's a diamond solitaire. I feel a little compelled to defend it sometimes, but oh, well. It was what I really wanted deep down, and I'm happy with the price. My friend when to a bridal shop. Feel in love with a dress but couldn't stomach the price. Went home and found the same dress (and size) on either eBay or Craigslist (I can't remember which) and bought it (for half the price). The seller also threw in shoes for free and all my friend did was dry clean it and after her wedding turned around a sold it again for the same price. Just a suggestion if you want to see your dress.